Although Seneca's former mighty Arctic cold waves may have been toned-down by global warming (see bottom of previous page), Seneca is still capable of generating some extreme minimums that would cause old records to fall in any of the major U.S. cities (outside Alaska)... Click here to skip to a listing of the major cold waves to hit Seneca since the Big One of 1933! 35 below zero not cold? 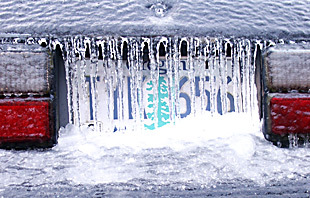 Oregon's most recent major arctic cold wave hit in very late January of 1996. By old-time Seneca standards, this was only a moderate cold wave, which set no new records on any of its five days... Here are the figures for the 1996 cold wave: January 30, low temperature was 8 below zero... January 31, low was 19 below zero... February 1, low was 20 below zero... February 2, low was 35 below zero... February 3, low was 32 below zero... February 4-- the cold wave abruptly broke...(click here to see some examples of really major cold waves in Seneca!. Early Season Cold-- one truly remarkable thing about cold in Seneca is how early in the season it can occur, and this facet of Seneca's climate doesn't appear to have warmed up in recent years, eg. in Fall of 2002 a major cold spell began on October 12, and continued through the end of the month.... October 12-20 had nine days in a row with ground-freezing cold, beginning with an amazing 4 above zero on October 12, and continuing for eight more nights with lows of 4 to 12 degrees; then a few days of warming, followed by four more nights in the 5 to 9 degree range.... Then, October 31 hitting 11 below zero, which was 2002's lowest recorded temperature in Seneca.... Followed by a chilling 9 below zero on November 1.... such early season cold can also be mirrored in Springtime in Seneca, eg. March 18th, 2002 had 4 below zero-- goodbye to all your spring bulbs at those temperatures! The Daily Rise and Fall of temperatures is called "Diurnal change." Seneca ought to also be famous for its insane dirurnal temperature changes... Often late summer/early fall is the prime season for these, with very clear dry air and longer nights to foster intense radiational cooling. Example: October 7, 1964, high of a summery 82, but a morning low of 22 degrees. The day before had had a low of 18, with a high of 78. These daily changes of 50-60 degrees are not unusual in Seneca... And there are places in Oregon with even more insane diurnal changes than even Seneca! My contender for that honor goes to the little hamlet of Fremont, in the Fort Rock Valley of Central Oregon, perhaps 60 air miles SE of Bend. A sample from the record: September 23, 1993: morning low of 10 and afternoon high a very pleasant 71--- Note: Fremont was a regular Co-op reporting station for many decades, but more recently appears to have been replaced by a station named "Cabin Lake," some 10 miles to the NE; Cabin Lake is part of a small park, and my monitoring of it so far shows it to be quite comparable to the old Fremont in terms of climate. Arctic King Seneca at its Best--- REAL COLD WAVES! 1985. What a year! February of '85 shivered with a bleak 43 below zero early in the month. This was an evil thing which residents strove to forget during the pleasant summer which followed... But 1985 was to have three major arctic episodes. First, the arctic cold returned that Fall, clamping down hard by late November, when Thanksgiving saw a six day long period that got as low as 31 below (average low was 14 below). ... but November was just a prelude, and December 1985 was a brutally cold month for Seneca, which suffered through a record-setting string of sub-zero nights that lasted a full 21 days in a row, the cold finally breaking on the 22nd day, which was New Years Day 1986-- it was a balmy 1 above zero! 1983. An arctic sneak attack!... December 22nd, high 0, low 27 below zero. December 23rd, high a frozen 5 below zero with an achingly bitter 48 below morning. December 24th, Christmas Eve, high of 3 above, with low of 40 below zero. Then a heat wave came for Christmas Day, with a high of 17 above! 1989. The last of the cold waves of Giant Stature to hit Seneca: temperatures dipped to 48 below zero on February 6, with an average low temp of 39 below zero for five consecutive days during the fifteen day long cold wave! -- 1989 highlights an important facet of Seneca climate, which is the historic prevalence of huge cold events during the first two weeks of February. Some of Seneca's coldest-ever records have been repeatedly set -- not in December or January-- but instead in February, very close in time to when its all-time record low was set (February 10, 1933, 54 degrees below zero F.). No cold wave since 1989 has come close to the depth and length of the 1989 event, and the trend of global climate change points toward a theory that the 21st. Century will never see the likes of 1989's cold wave. Click here for a chart of the State's low temperatures from 1989 to the present to clearly see this warming trend. Winter 1978-79. This winter is often not remembered, but it was clobbered with severe arctic outbreaks twice in one month. The first blast set in right after Christmas, with Dec. 29th recording 34 below, then 41 below on Dec. 30th, 1978, then 35 below, then a 40 below to usher in New Years of 1979, finishing on January 2, 1979 with 25 below. That ought to have been enough for one winter, but late in the month another bad arctic outbreak hit Seneca hard. January 26 at 25 below, Jan. 27 at 20 below, Jan. 28 at 29 below, Jan. 29 at 33 below, Jan. 30 at 37 below, Jan. 31 at 34 below, Feb. 1 at 29 below, Feb. 2 at 39 below, and Feb. 3 at 34 below (and then very abrupt warming for Feb. 4th). 1972. Here was a terrible early December cold wave of major proportions that lasted for twelve days (remember, officially, winter does not even begin until December 22!)...... Here are the daily low temps for the twelve days... December 4th, low of 0. Then the cold rapidly got much worse, with daily lows as follow: -26, -17, -15, -36, -40,-37, -35, -29, 5 above, -18, and -16 on December 15th.... A personal note on this cold wave: I spent an exciting 5 days camping out in the midst of this cold wave. I was camped near Sisters and the Metolius River, where it was "only" 28 below zero on the coldest night... A remembered sight from that camp will stay forever with me: it's the bright sunlight streaming through ponderosa needles with the air glittering all over with tiny suspended ice crystals! 1957. Now we're talking the snarling cold Seneca of historic record!... January of this year featured two separate major cold waves, together lasting nearly the entire month! On January 16th, the cold wave hit, with a low of -20.... The following four nights had an average low of -14.... Then there were four days of relative respite, with lows ranging from 4 to 10 above zero..... but then major cold struck again, even harder, lasting all the way through to the bitter end of the month. January 25 had -14. January 26 shivered at -43. January 27 at -40. January 28 still at -37. January 29 still at -33. January 30 at -29. January 31 at -26. February 1st. saw a large incursion of much warmer air and an astounding warm- up, with a low of 27 ABOVE! But even then the cold wasn't over, and a few days later it was down to 18 below again, during a six day long cold snap that lasted until the middle of February. 1955. This year featured a very intense mid-November arctic air invasion that lasted 2 to 3 days. It produced astoundingly low readings for so early in the season. An interesting facet of this cold wave was that it went mainly along the western side of the Cascades in Washington, eg. producing 1 below zero in Olympia, Washington on November 15th, but only 3 below on the east side in Yakima. (Olympia's all-time record low is only a few degrees colder!) .... Meanwhile, the cold did penetrate Oregon, with Redmond recording 14 below, and Portland recording a comparatively mild 13 above. Seneca, however, in its usual "Arctic King" manner, took this early-season cold wave and turned it into a very impressive 31 below zero on the morning of November 15th, 1955! * My definition of "recent" is "since 1951." Weather records for most Eastern Oregon weather sites got digitized only back to 1949/1950. But please recall that due to the ill health of Mr. Howard Lohf (Seneca's long-time observer) there are no weather records from Seneca for either 1949 or 1950. This is very unfortunate because both years had extraordinarily cold winters which undoubtably would have broken several records. Local reports from Seneca in my possession state firmly that it hit 50 below zero on January 31, 1950, which, if confirmable, would constitute the most recent time that Oregon has hit 50 below zero! (on this date, Prineville, Oregon recorded 30 below zero, and historical records consistently show that it is not unusual for Seneca in a major cold wave to be 15-20 degrees colder than Prineville). Want to respond to this page?